Cotton has been on a roller-coaster ride over the past decade – to record high prices and then partial collapse. This was followed by China’s decision to build the world’s largest ever cotton inventory as part of its post-2009 stimulus programme, to protect cotton farmers. This inventory, being off the market, means cotton has been an island of calm in the commodity storm over the past year. But there are signs this may be changing again. But in 2005, the oil price began to rocket in the subprime bubble period. The story then became even more complex in 2009, after the subprime collapse. Policymakers in the West rushed to do major stimulus, and once again this caused the oil price to rise to artificially high levels. And at the same moment, nature took a hand, with the major US cotton-producing areas of Texas and Louisiana suffering a major drought. It was all a very long way of the simple story of the past, when cotton and PTA/polyester would compete against each other. But clearly, at some point, the markets would have to take the pain of leaving stimulus behind. And it seemed, if you didn’t dig too deeply, that this was starting to happen. 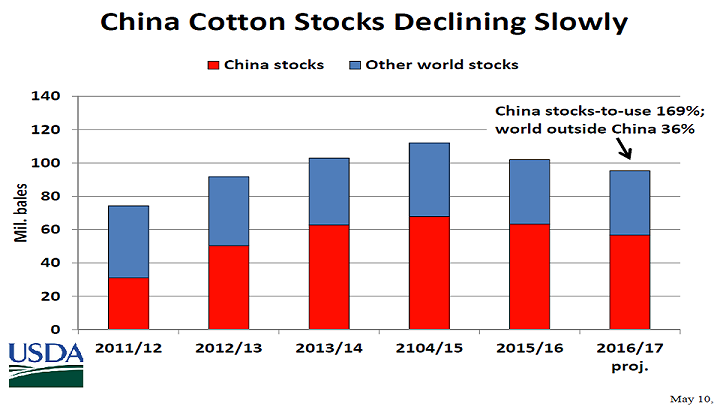 Cotton prices had already crashed from 230c/lb to 90 c/lb, as people began to recognise that global stocks were now sufficient to make 3 pairs of jeans for everyone in the world. And they fell again in March 2014, as it became clear that the US drought was over. 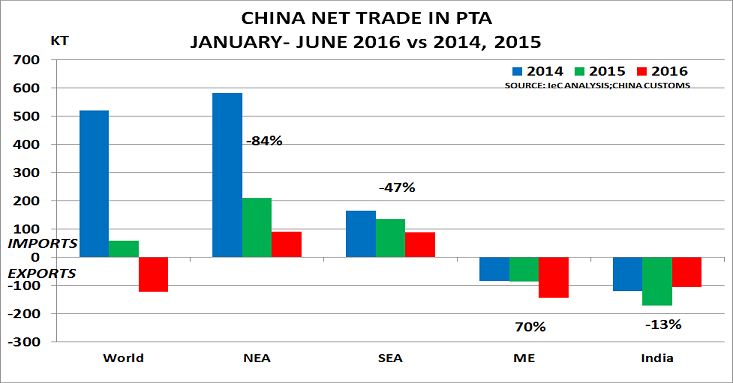 But then, another result of the stimulus programme began to impact the textile market – as China’s PTA capacity started to increase. Before long, China had opened enough capacity to supply the entire world market. Almost overnight, it therefore stopped its PTA imports – which fell from 6m tonnes in 2012 to virtually nothing in 2015. Effectively, China had exported its over-capacity problem to the rest of the world, causing major problems for all those exporters who had relied on its demand. They are not cheering today, of course, as the message has finally begun to sink in about the real state of China’s economy. But the story doesn’t end here. The reason that cotton has been an oasis of calm over the past year is that its major cotton producer is an army-owned company. This had the political clout to block necessary moves to sell off the cotton stocks. But clearly President Xi couldn’t allow this situation to continue forever. So now, the government is starting to force the issue, and is able to use the additional argument that the stored cotton is starting to age, which will impact its colour and spinning properties. Clearly today’s cotton stocks have to be reduced to more normal levels. But the pain of doing this is going to be immense – not only for the cotton industry outside China, but also for the PTA producers. The whole saga is an excellent example of the follies of the stimulus period. And it means the PTA industry desperately needs to find a new way forward. We have some ideas on this, which will be set out in our new 5 Critical Questions Study, which will be published shortly. Globally this meant there was enough cotton in store to make 3 pairs of jeans for every person in the world. Thus the scene was set for further price declines. Last March, players began to realise the US drought was over, and that China’s new leadership was now subsidising farmers directly, rather than stockpiling. December 2014 thus became a key date, as the new US crop would then be ready for delivery. And now last week’s downbeat analysis from the US Department of Agriculture has confirmed everyone’s worst fears. It forecast 2015 US production would rise 25% and global stocks would rise to 109m bales – with 63m bales in China. 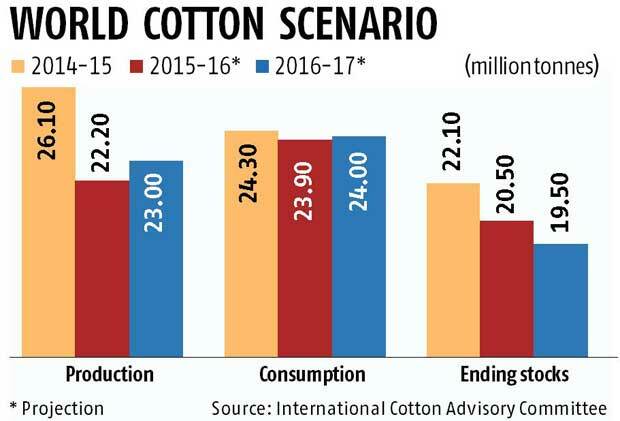 Cotton, of course, competes with polyester in the world’s fibre and apparel markets. And last March, oil prices had not yet begun to collapse. So it seemed possible that cotton could gain market share and hence additional volume. Today, however, oil prices are already back at $50/bbl. This matters, as the post-2009 jump in cotton prices had also led China to vastly expand PTA capacity (terephthalic acid), the oil-based raw material for polyester. PTA prices in China have already fallen 45% since mid-August, and will likely weaken further ahead of China’s Lunar New Year holiday on 16 February. So cotton’s brief period of improved price competitiveness is already history. This will be very good news for hard-pressed consumers and retailers. It means apparel prices have plenty of scope to fall quite dramatically, as cotton and polyester battle for market share. 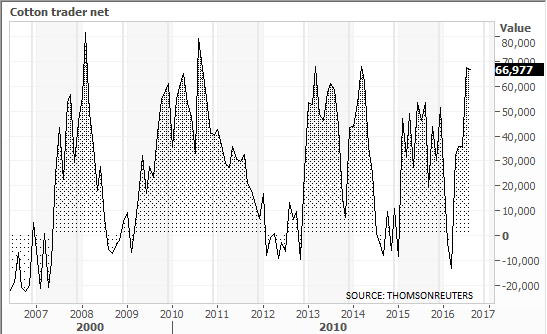 But it will be very bad news for central bank hopes of stimulating inflation. Instead, a collapse in apparel prices will help create the ‘deflation shock’ their stimulus policies were meant to have made impossible.